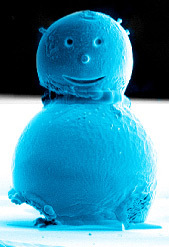 The National Physical Laboratory has deployed a range of techniques to create the world's smallest snowman - a diminutive fellow just 10 µm across, or "1/5th the width of a human hair". The NPL explains: "The snowman was made from two tin beads used to calibrate electron microscope astigmatism. The eyes and smile were milled using a focused ion beam, and the nose, which is under 1 µm wide (or 0.001 mm), is ion beam deposited platinum. "A nanomanipulation system was used to assemble the parts 'by hand' and platinum deposition was used to weld all elements together. The snowman is mounted on a silicon cantilever from an atomic force microscope whose sharp tip 'feels' surfaces creating topographic surveys at almost atomic scales."